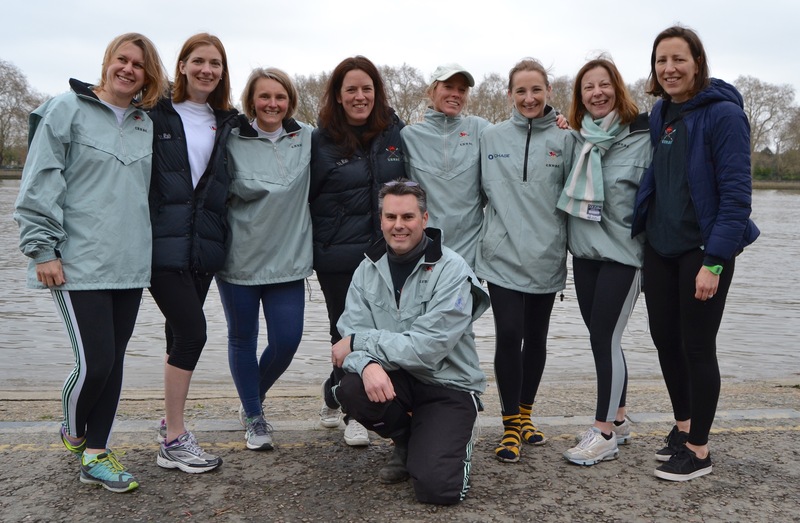 The Oxford Crew for the 2019 Oxford – Cambridge Veterans’ Race. With the exception of Ladbrokes (1976 – 1981), this picture also shows the history of sponsorship of the Boat Race. On display is kit from Beefeater Gin (1982 – 1998), Aberdeen Asset Management (1999 – 2001), Xchanging (2002 – 2012), and BNY Mellon (2013 – present). 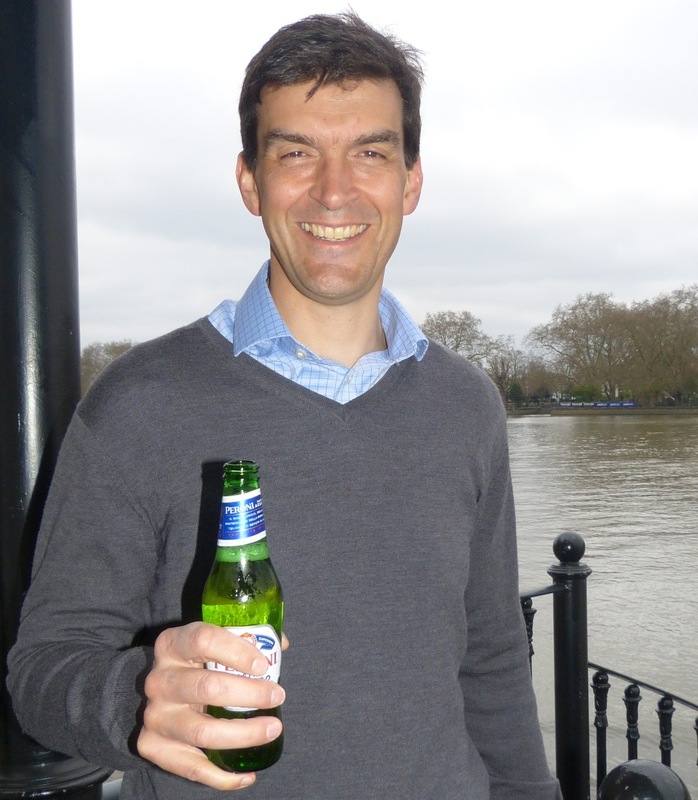 Tim Koch follows his favourite Boat Race, P to H.
In last Sunday’s Boat Race, a lot of publicity was given to one man because he was twice the age of each of his crewmates. 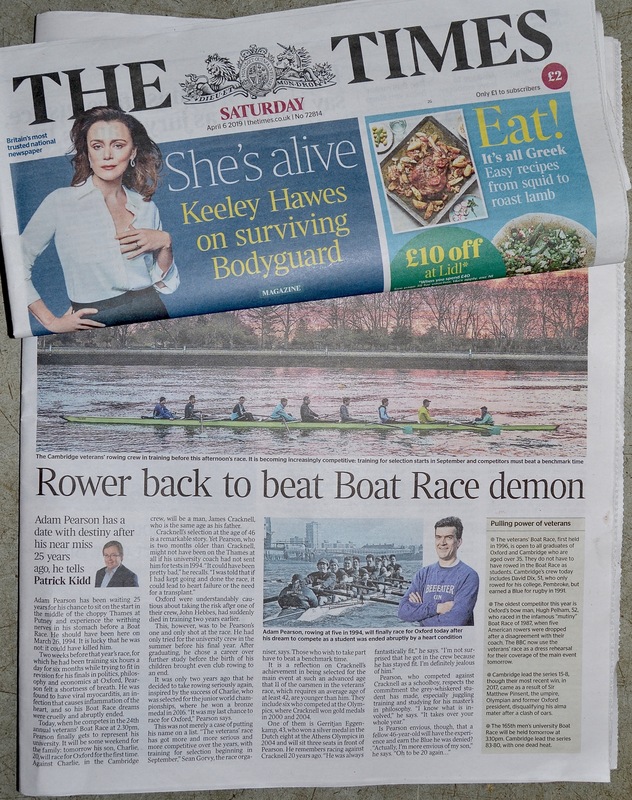 Therefore, it was only fitting that a race run the previous day containing 16 oarsmen old enough to remember a time before Broadband should attract the attention of The Times. Unusually, the newspaper devoted over half a page to a rowing event, a rather obscure one at that. 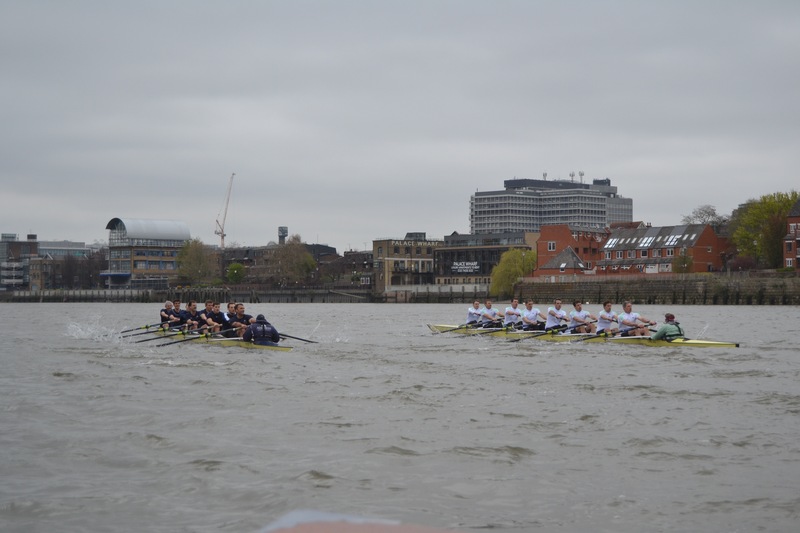 This was the 24th Oxford – Cambridge Veterans’ Race, run between Putney and Hammersmith. Although the more famous Oxbridge races, the ones traditionally reserved for youngsters with backs, knees, hearts and lungs that can be relied upon to hold up beyond Hammersmith and onto Mortlake, are splendid events, the Vets’ Race is often a more entertaining show. In the last few years, in particular, the racing has been close throughout and neither crew has started as favourite. When the race was a comparatively new event, the Cambridge old boys took it more seriously than did their Oxford counterparts. As a result, the 2018 score stood at 15 – 7 in favour of the Light Blues. However, in recent years both have become as competitive as each other, selection now begins in September and there is a benchmark ergo score to be reached. Perhaps as a result, the last four contests have seen overlapping at the finish. I have been covering the event since 2011 and in that time, neither university has won more than twice in succession, something that adds to the unpredictability and excitement. Despite the increasing seriousness with which the race is taken, it still has the gentlemanly rule that ‘Any verdict within six feet shall be declared a dead heat’. 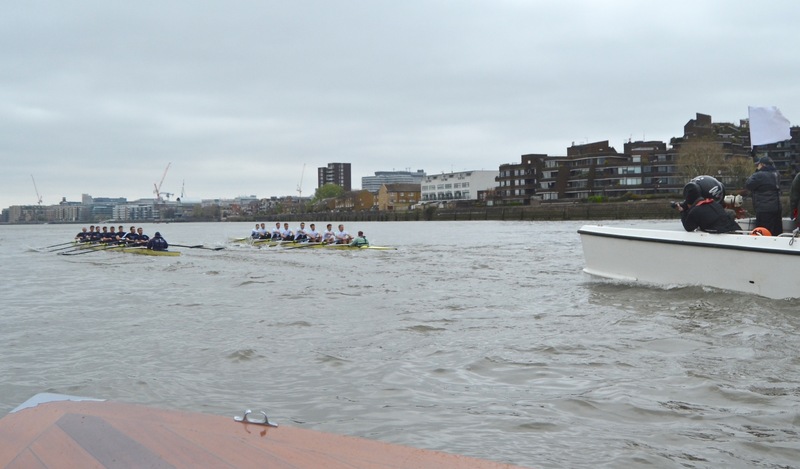 The 2019 Cambridge boat included event stalwarts and Olympians, Tom Middleton, Matt Parish and Nick English. The minimum for any individual is 35 and the crew’s ages ranged from 35 to 51 with the average the qualifying minimum of 42. 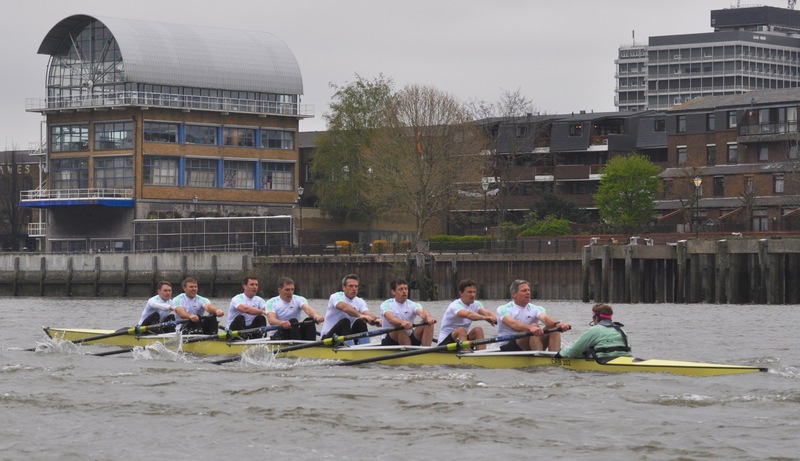 Five of the 16 oarsmen were older than James Cracknell. Oxford put out an impressive all-Olympian stern four of Tom Solesbury, Robin Bourne-Taylor, Gerritjan Eggenkamp and Ante Kusurin. They too averaged the minimum 42 with ages from 35 to 52. 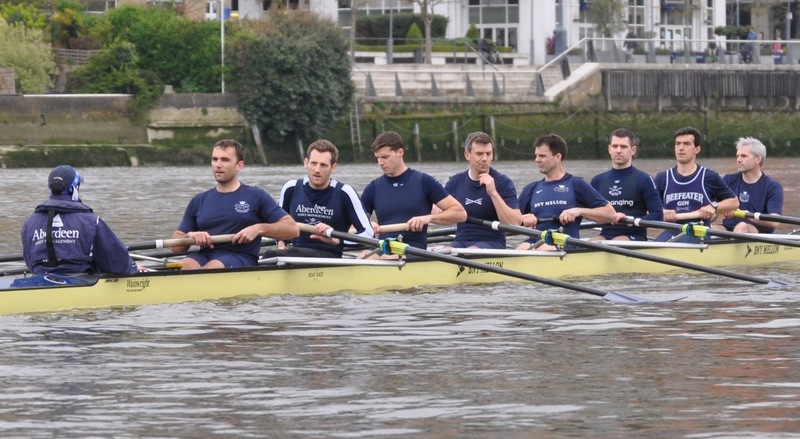 The Dark Blue’s average weight was 14st 6lb / 91.62kg, which was 7lb / 3.17kg heavier than Cambridge’s 13st 13lb / 88.45kg. Patrick Kidd, the rowing correspondent of “The Times” when they had one, picked up on the ‘human interest’ story in this year’s Oxford Crew. Adam Pearson had an opportunity to line-up on the Boat Race start for the first time having missed his Blue in 1994 due to a serious illness. Also, his son, Charlie, was rowing for Oxford in next day’s Boat Race. 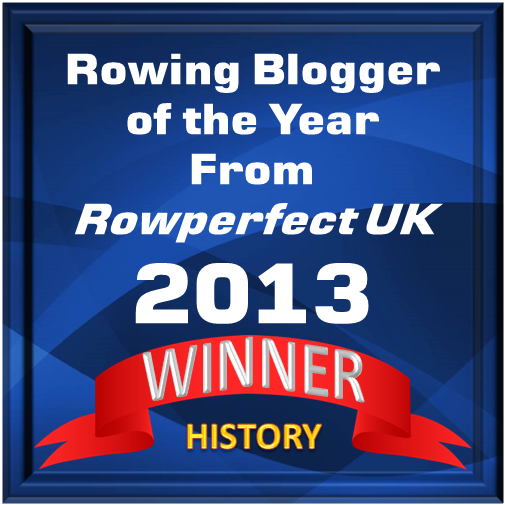 Rachel Quarrell of the Daily Telegraph and of Row360 magazine was timekeeper and finish judge. She also wrote the excellent official race report, reproduced below in italics. 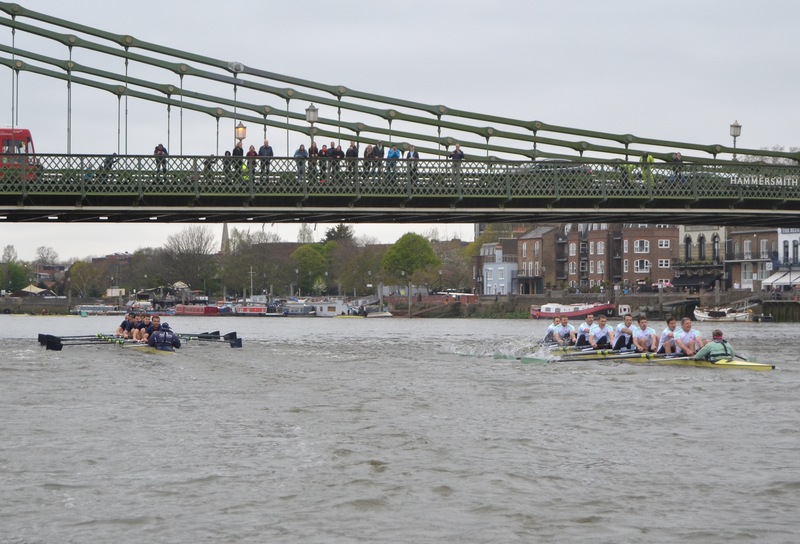 Oxford’s alumni men won the 24th Veterans’ Boat Race in a tightly fought but courteous scrap in which neither crew gave quarter over the 2-mile course from Putney to the Furnivall Steps just past Hammersmith Bridge. Oxford had won the toss and chose Surrey for the second-bend advantage, hoping to play to their strength and stamina in the second half. They were half a stone heavier, but the pedigree of both was considerable, boasting a wide range of Blues and no fewer than seven Olympians between the two clubs. Under glowering grey skies and with the BBC helicopter hovering noisily overhead (the event is used as the BBC technical test) the crews slid through Putney Bridge and after a few taps managed a well-judged floating start, getting away cleanly first time with both crews rating above 45 for the first few strokes. Cambridge’s rate-lift was fractionally feistier, the Light Blues taking the first slight but visible lead as they built towards their stride, but Dark Blue stroke Ante Kusurin chose to keep the Oxford rate high for the next twenty strokes and it paid dividends, nailing Cambridge back and then pulling out first a canvas and then two seats’ lead. As they neared Barn Elms, Cambridge began to push back into contention, and now the umpire’s flag was warning both crews equally. This and the headwind they hit coming to the corner of Fulham Football Ground cost Oxford dearly, they stumbled, lost some of their rhythm and the more composed Light Blues seized their chance with glee. 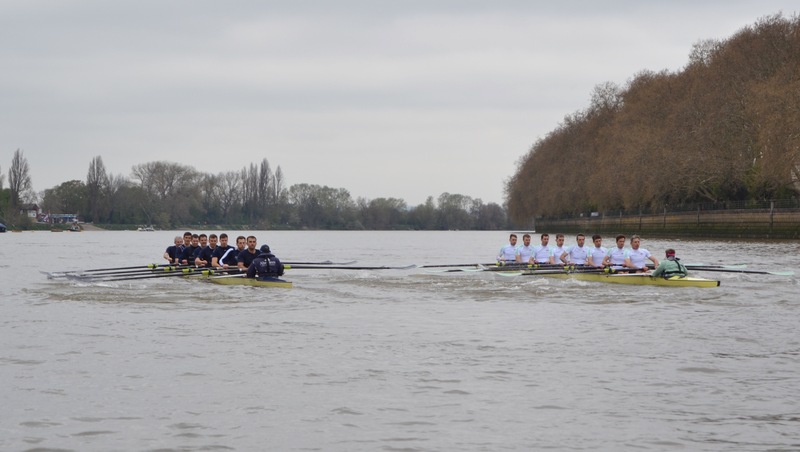 A single brief clash between the Oxford 7 and Cambridge 6 just past the corner barely unsettled these experienced crews, and as they swept past the Milepost the crews were virtually level. Umpire Packer warns both crews to move apart. So here we were: reset and start again. From the Mile Post it was effectively a new sprint to the finish and Oxford, regaining their lost rhythm, rapidly took advantage once more. 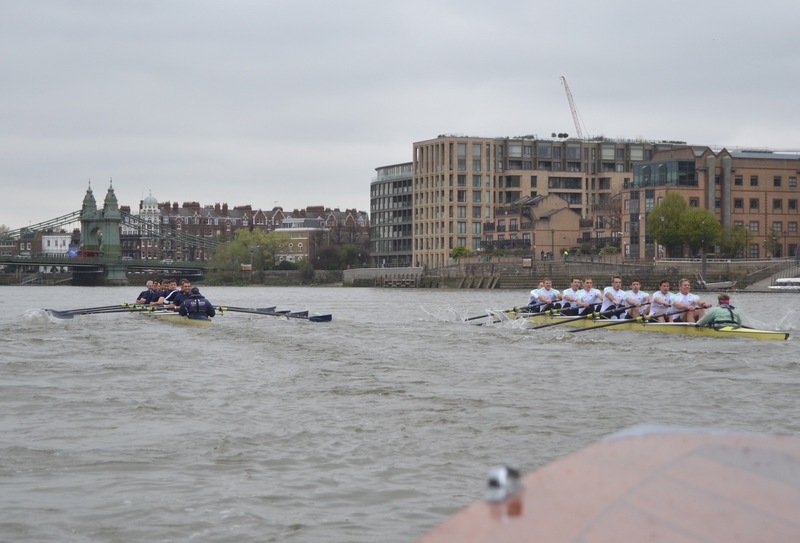 For half a minute the two crews rowed in sync at 34.5, but Oxford was inching their bows ahead with every stroke (and being regularly warned) until they had half a length at the first set of riverside flats, and seven seats by the time they reached the autumnally-coloured Harrods Depository. Oxford in Fulham Reach. From bow: Hugh Pelham, Adam Pearson, Andrew Brennan, Richard Manners, Gerritjan Eggenkamp, Tom Solesbury, Robin Bourne-Taylor, Ante Kusurin, Peter Hackworth (cox). Cambridge in Fulham Reach. From bow: Nick English, David Nelson, Chris Le Neve Foster, Iain Edmundson, David Dix, Jonathon Davies, Tom Middleton, Matt Parish, Ed Bosson (cox). Cambridge dug in to stop the rot with Hammersmith Bridge rapidly approaching, stroke Matt Parish leading push after push, but despite Oxford being the focus of the umpire’s attention again, the Dark Blues held the upper hand and did not need to lift their cadence to the finish, much to the disappointment of crew coordinator Jonny Searle, who was gesturing for them to sprint harder from the following launch. The two crews swept past the dead tree opposite Furnivall safely on their own stations (which doesn’t always happen) and still in contact. 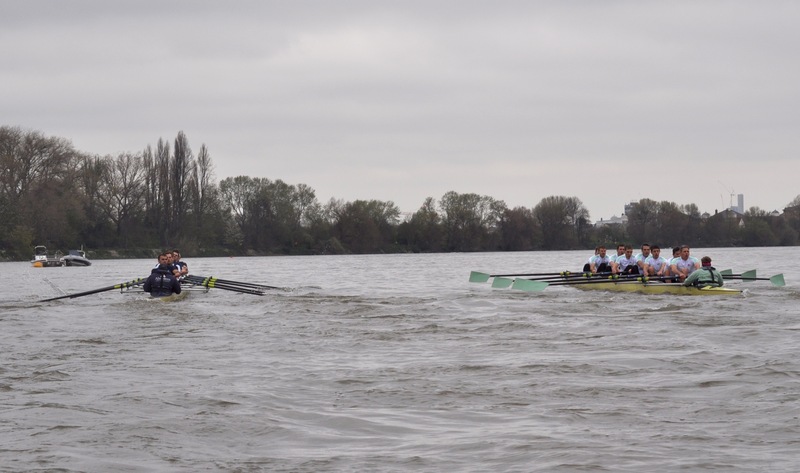 The margin, being a few feet short of clear water, was adjudged 7/8 of a length to Oxford, but was a credit to two spirited and determined crews. At the Bridge, Oxford with about 20 strokes to go. The last few strokes, parallax error making the finish distance seem much bigger than it was. Oxford 2-seat Adam Pearson found redemption in the win, 25 years after having been pulled unceremoniously from the Dark Blue crew due to a heart infection two weeks before his planned appearance in the famous race. 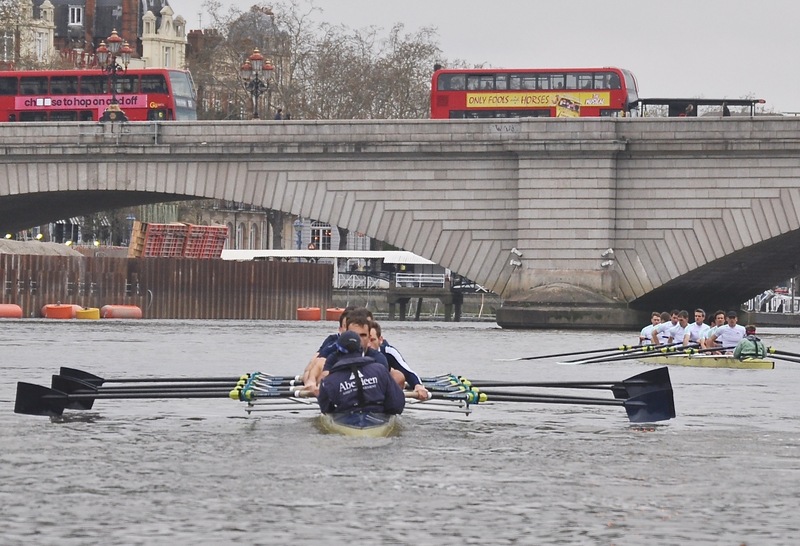 Tomorrow his son Charlie races in the Oxford Blue Boat, thought to be an unprecedented example of father and son rowing against Cambridge on the Tideway in the same weekend. Adam Pearson after racing in a Blue(ish) Boat at last. Unfortunately for him, he was to be the only Boat Race winner in his family that weekend. This ends the official report. Afterwards, I talked to some of those involved. Jonny Searle (Oxford crew coordinator). I thought that it was a fantastic race. Both crews now are training hard and taking it seriously. 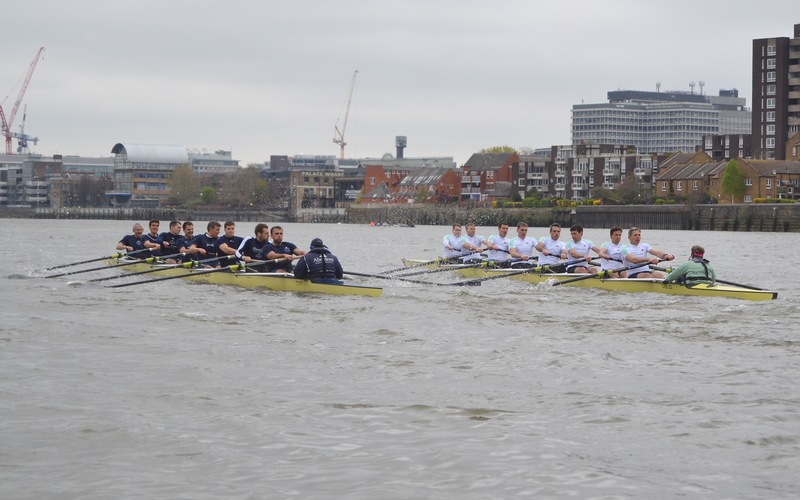 When you collect together sixteen pretty fit guys, even though they are older, the margins are close… The Oxford Crew was probably a bit more powerful, a bit heavier than the Cambridge crew, but it was not known how they would respond to the headwind and choppy water. Donald Legget (Cambridge coach) candidly said afterwards that he had expected Cambridge to lose ‘by about four lengths’. 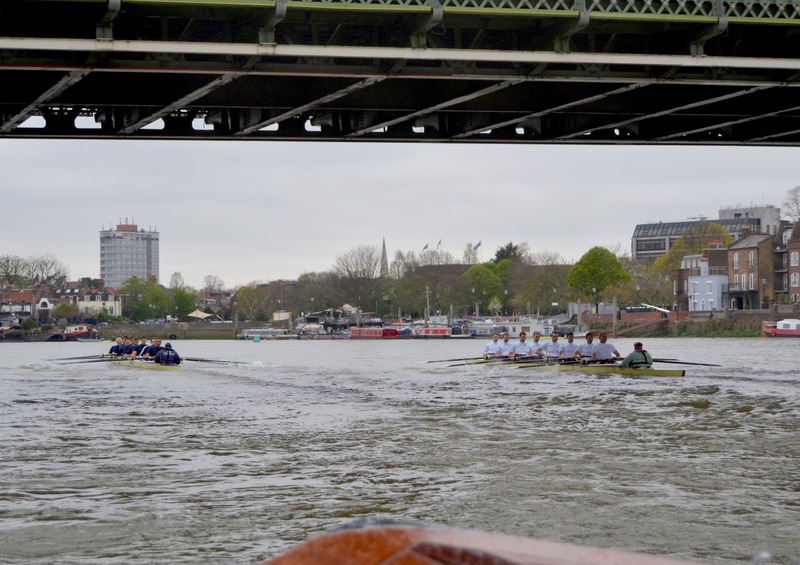 Coming up to Hammersmith Bridge… they were rowing stroke for stroke but (Oxford) just had more power… a very good race. Judith Packer (Umpire). 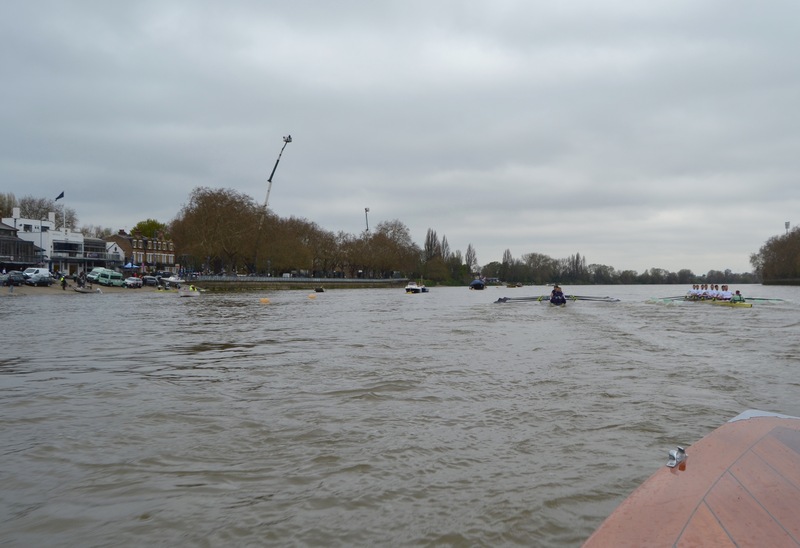 It was a cracking race… there was overlap the whole way down the course… The coxes were defiantly keeping me busy… they seemed to enjoy the knitting of the blades but nothing to warrant stopping the race… both coxes responded (to warnings). There is, as yet, no Veteran Women’s Race, but Putney did see this reunion row of the 1999 Cambridge Women’s Lightweight Crew, all looking fit enough to demand a rematch against the Oxford crew that defeated them at the Henley Boat Races 25 years ago. The rules of the Vets’ Race say that ‘crews will be selected from full graduates of the University’ but adds ‘and any full Rowing Blues without that qualification’. 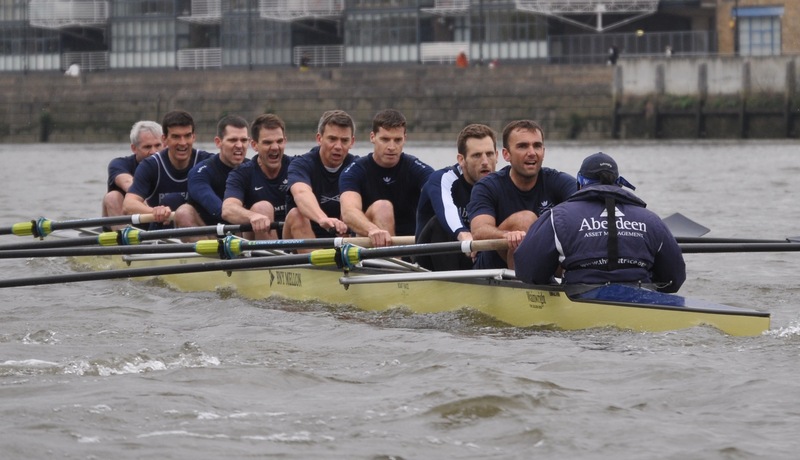 So, perhaps next year the Cambridge ‘2’ man from this year’s ‘real’ Boat Race will turn out for the old Light Blues. Watch this space.